For other uses, see Jim Galloway (disambiguation). James Braidie Galloway (28 July 1936 – 30 December 2014) was a jazz clarinet and saxophone player. He based his career in Canada since emigrating from Scotland in the mid-1960s. He formed the Wee Big Band in the late 1970s. His album Walking on Air was nominated for Best Jazz Album at the Juno Awards of 1980. 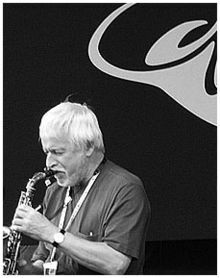 He was artistic director of the Toronto Jazz Festival from 1987–2009. In 2002 he was made a Chevalier of the French Ordre des Arts et des Lettres. Galloway died in palliative care in Toronto on 30 December 2014. ^ Miller, Mark (2002). Barry Kernfeld, ed. The New Grove Dictionary of Jazz, vol. 2 (2nd ed.). New York: Grove's Dictionaries. pp. 7–8. ISBN 1561592846. ^ "Jim Galloway leaves Toronto Jazz Festival". The Globe and Mail. 22 October 2009. ^ "Jim Galloway (1936-2014)". JAZZ.FM91. 30 December 2014. This page was last edited on 2 March 2019, at 22:33 (UTC).